on July 31, 2014, in Washington, D.C.
L to R: Bonnie Rice,157th Air Refueling Wing Airman & Family Readiness Program Manager at Pease Air Force Base; Randy Kassa, Maine Department of Education Military Family Education Liaison; Dr. Maryann Minard, Portsmouth Naval Shipyard School Liaison Officer; Lieutenant General David L. Goldfein Director, Joint Staff, the Pentagon, Washington, D.C.; Dr. Mary Keller, President and CEO Military Child Education Coalition; Captain William C. Greene, Commander Portsmouth Naval Shipyard; Sarah Smiley, Military Interstate Children's Compact Maine Council member; Andrew Glazier, President Rotary Club of Kittery, ME. Five Awards were presented to partnerships involving K-12 public school districts category. "The annual award encourages and applauds the outstanding partnerships that exist between military installations and school districts and bring special recognition to those partnerships that demonstrate General Taylor's long-held belief that 'goodness happens at the local level'." The Rotary Club of Kittery was one of the partners along with the Portsmouth Naval Shipyard, Kittery School Department, Maine Department of Education and the Maine Military Interstate Compact Council who received the 2014 Recognized Partnership Award for Commitment, Community and Collaboration in Building Systems of Support for Military-Connected Children in Maine. The Rotary Club of Kittery is very proud to be part of this partnership and award! Coalition salutes partnerships between military installations, school districts, colleges and universities serving military children. HARKER HEIGHTS, TX, August 1, 2014 – The 2014 recipients of the LTG (Ret) H.G. “Pete” Taylor Partnership of Excellence Award™ were recently announced by the Military Child Education Coalition® (MCEC®) at its 16th National Training Seminar in Washington, DC. This annual award encourages and applauds the outstanding partnerships formed between military installations and school districts that serve military children. Award winners are selected from schools and military installations around the world by MCEC, a non-profit organization dedicated to addressing the transition and educational issues affecting the highly mobile military child. 2014 Outstanding Partnership Award: The Education Initiative - Partners: Joint Readiness Training Center and Fort Polk, Vernon Parish School District, Fort Polk Progress, The Rapides Foundation, Louisiana Department of Education, Louisiana Economic Development, Northwestern State University, Louisiana Tech Community College, and Vernon Parish Chamber of Commerce, Louisiana. 2014 Exemplary Partnership Award: Full STEA+M Ahead – Partners: Naval Air Station Jacksonville, School District of Clay County, Department of Defense Education Activity, Clay Action Coalition, Inc., University of North Florida-Brooks College of Health, Saint Leo University, St Johns River State College, Thrasher-Horne Conference Center, Florida Department of Environmental Protection, Girl Scouts of Gateway Council, Navy Entomology Center, Fleet Readiness Center Southeast, University of Florida, and Navy Hospital, Florida. 2014 Exemplary Partnership Award: Barksdale/Bossier Connection – Partners: Barksdale AFB, Bossier Parish Schools, and Bossier Chamber of Commerce, Military Affairs Council, Barksdale Forward, Cyber Innovation Center, Greater Bossier Economic Development Foundation, Representative Henry Burns, Republican District 9, Louisiana. 2014 Recognized Partnership Award: Power Up Team Holloman – Partners: Holloman AFB, Alamogordo Public Schools, and City of Alamogordo, New Mexico. 2014 Recognized Partnership Award: Commitment, Community and Collaboration: Building Systems of Support for Military-Connected Children in Maine – Partners: Portsmouth Naval Shipyard, Kittery School Department, Rotary Club of Kittery, Maine Department of Education, and Maine Military Interstate Compact, Council, Maine. 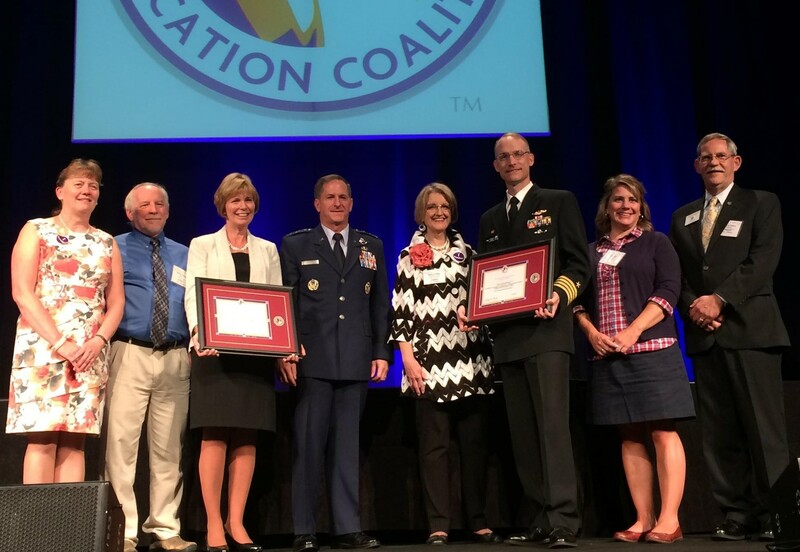 The Higher Education Award, recognizing the efforts that exist in our colleges and universities, highlights and encourages the outstanding teacher preparation programs that include critical information and experiences focusing on military-connected children. Founded in 1998, the Military Child Education Coalition® (MCEC®) is a 501(c)(3) global, nonprofit leadership and advocacy organization focused on ensuring quality educational opportunities for America’s two million military-connected children affected by mobility, family separation, and transition. For more information, visit www.MilitaryChild.org.